This is another in The Australian Women’s Weekly series of chunky books which explore fast but delicious food (see more here). There are 180 recipes that will only take you 35 minutes to cook …no, not all at the same time, but one meal in just over half an hour is pretty good going. 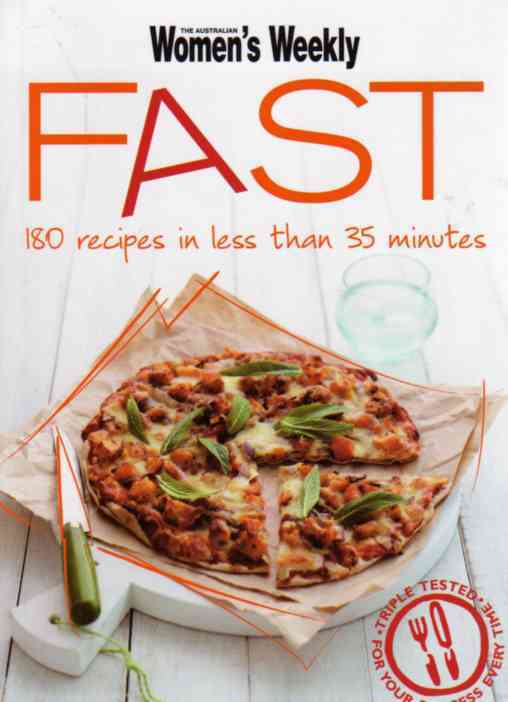 Fast is a small-format, chubby book with photographs of every one of those 180 recipes. I don’t think pictures are essential for the more experienced of home cooks but they do give a bit of confidence to the culinarily challenged or to the novice. Having said that I should mention that any dish that only takes 35 minutes to cook is not going to be over-taxing. It’s not just mid-week evenings that will find you short of time. Mornings are a scramble trying to get children and wife off to work, but you want to give them a healthy and sustaining breakfast before they go. It’s said to be the most important meal of the day. How about Cheesy Scrambled Eggs with Spinach? (Different sort of scramble.) Preparation time 5 minutes, cooking time 5 minutes, eating time 1.5 minutes, and serves four. It’s lunchtime and it’s your turn to entertain. It’s possible in 35 minutes to present your guest with a sophisticated Mediterranean meal that will make you look like you have slaved for hours. Tomato, Pesto and Olive Tart takes 10 minutes to make (using bought puff pastry) and 20 minutes to cook. That leaves you enough time to clear up in the kitchen so your friends will also suppose you have a “lady that does” a couple of times each week. Thus you pass a no-stress lunchtime and your social status is elevated. Dessert is often the first victim of rush. I tend to think of sweets as being more time-consuming than the main dish but Fast offers a good selection of quick and easy options. I am a lover of self-saucing puddings and there is a Lemon and Mixed Berry version that is a delight. These take 15 minutes to prepare and 15 minutes to cook and they are foolproof. Fast also tempts you with baked goods to satisfy your sugar craving. Berry Yogurt Muffins will be on the table in half an hour, or Hazelnut Tiramisu from the Weekend chapter is a lovely twist on the original and is super-fast, taking only 20 minutes. Fast is a book for those of us who love good food but need to find ways of cutting down on kitchen time. There is no need to resort to costly takeaways or frozen ready meals. It’s easy to eat well with the minimum of time spent in preparation. This is a practical book filled with ideas for mouth-watering dishes that are sure to work. They have been triple-tested by those nice people at The Australian Women’s Weekly. Great value for money.